I’m all about printable valentines that work perfectly for gifts other than sweets. Riley and I put together her Butterfly Clip Valentine Printables for the girls in her class, but we needed something for the little boys. I was aimlessly walking through Target hoping that something would jump out at me when I these rainbow colored, rubber poppers “popped” right out at me. 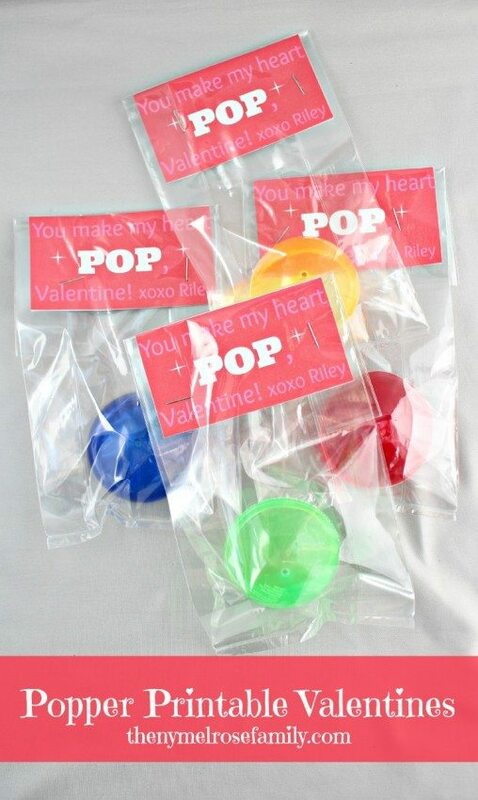 I immediately thought these would be perfect for Popper Printable Valentine. This was the first time for Riley seeing them and she was so thrilled. I have to stay away from food for Valentines because there are severe allergies in her class so these are just so fun. Thanks Adrienne! My boys love the poppers. I would like to use these for Valentine’s this year. Is there a way to edit your card to personalize with my son’s name on it? your technique of blogging. I bookmarked it to my bookmark site list and will be checking back soon. Take a look at my web site as well and tell me your opinion.